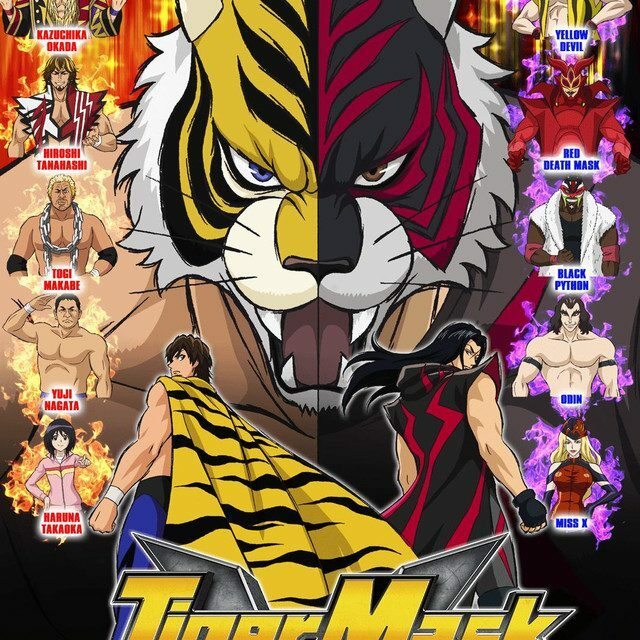 The first episode of Toei’s new Tiger Mask revival anime, Tiger Mask W (pronounced “double” not “double-u”), has aired and it’s quite the interesting show. While it’s very well made and the story is interesting, most of the intrigue for me (and I’m assuming for people that read VOW) came from the meta implications in the story. In that regard, this anime is very much like an actual wrestling show. Sometimes the show behind the show is more interesting than the show itself. While you might initially assume that the main antagonist of this series would be the Black Tiger character, known here as Tiger the Dark, that doesn’t really seem to be the case. Instead the villains appear to be the Tiger’s Den, the wrestling school that trained Tiger the Dark, and the GWM. The Global Wrestling Monopoly is a far reaching wrestling company that is easily the biggest name in the wrestling business. Though after a particularly brutal and bloody match three years prior to most of the events in this episode, the GWM lost their foothold in Japan. That match looks to be the catalyst for the entire series, motivating both Tiger the Dark and Tiger Mask to begin their journeys after being at ringside for the destruction of their mentor at the hands of the evil Yellow Devil. In present day, GWM is looking to take back Japan and they’re beginning their campaign with a show called WRESTLE MAX, which will be headlined by GWM’s big star Odin taking on a Japanese wrestler named Kaioh Mikasa. GWM presents Mikasa as a big name, but in reality, he’s a solid hand that is there to get squashed to further the idea of GWM’s superiority. The scene after the WRESTLE MAX announcement, we get the lone inclusion of a New Japan wrestler in this episode. Kazuchika Okada prepares for his match and talks with a young lion about that upcoming show, saying he’d never wrestle for them because he wouldn’t want to help their business. It’s an odd scene for a couple reasons. Firstly, in a series like this, you wouldn’t assume that the wrestlers would ever talk about the business aspects of the wrestling industry. I figured that Okada would want to go to WRESTLE MAX to literally fight back the GWM invasion. This scene also establishes Okada as a company man, which really drives home the fact that the villain of Tiger Mask W is the cartoon version of the WWE. “We’ll do pro wrestling our way!” Okada exclaims, the subtext being that the New Japan way is the right way and the only way. As the episode progresses we get to see chunks of WRESTLE MAX, including the debut match of Tiger the Dark, but the main event is where it gets really interesting. It was supposed to be the GWM’s Odin taking on Mikasa, but at the last second, Mikasa is declared to be injured. His replacement? An unknown wrestler by the name of Tiger Mask. Odin controls the match in the early goings, but Tiger Mask is really just playing with him. Tiger Mask dominated the rest of the match, dislocating Odin’s shoulder and knocking him out with a spin kick. What comes next is absolutely fascinating. Tiger Mask makes a very calculated move and runs away, losing the match via countout. Instead of sticking around to claim victory and become a top star in GWM, he runs away leaving their top star looking like a joke and giving the audience a lackluster main event finish. This is an act of sabotage. As Okada said earlier, why would Tiger Mask help GWM’s business? Tiger Mask might have taken a loss on paper, but in the eyes of the fans, he’s the true victor that just made GWM look like a joke. The first episode of Tiger Mask W offers more depth than I ever thought it would. While this is a show that kids can watch and enjoy, this was very much written with an adult audience in mind. Toei gives the kids something exciting to watch while keeping the adults engaged with a deep story. Tiger Mask W looks at the complexity of the wrestling business in a way that I’ve never seen from something like this before. While it was easy to anticipate that this would be a very pro-New Japan show, it was a shock to see a thinly veiled WWE as the villain and an even bigger shocker to see the hero of the show attempt to beat them by killing their business. Tiger Mask W is well worth the time investment for wrestling fans. It takes the King of Sport seriously and approaches the business in a completely different way from previous wrestling anime like Kinnikuman. I don’t known how successful this series will go on to be, but I’ll be watching every episode.